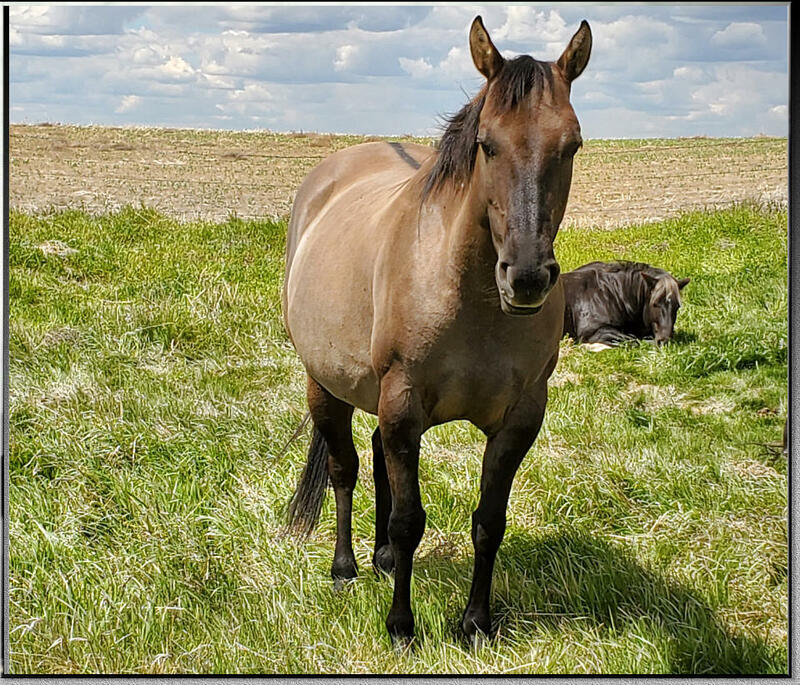 “Windy” Let us introduce you to Windy, our latest addition to the Prairie Silver breeding program. She is a beautiful Grulla mare, with a soft eye, baby doll head and dun factor in spades. Standing 15.2 hands high at four years old, this mare has great size, good feet and classic Quarter Horse conformation. Nothing fazes this girl ...the day after we brought her home she was ‘helping’ us put up metal siding on the paddock shelter. No spook in this young gal!! With her great size, nicely balanced conformation and sweet disposition, we anticipate great things from this mare, starting with her first foal in 2018 (see 2018 foals) a drop dead gorgeous Dun Silver colt. She is bred back to Hancocks Silver Boy for a 2019 foal.